When I was a kid we took a cross country trip with our dog. After a while, the dog could recognize rest stop signs; whenever she saw one she’d freak out and try to jump on the driver because she thought it was time to get out and run around. As a veteran of drive-thru operations (I did so for some years before moving on) I can confirm this to be true. 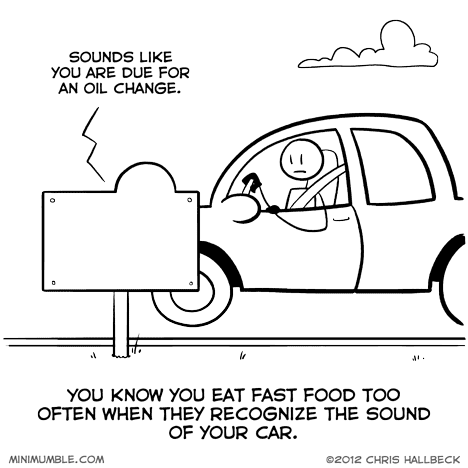 And for god’s sake, don’t you know you deisel drivers/poor engine repair drivers deafen the kids in drive-thru with your noise, then have the gall to complain when they request you shut off your engine so they can hear you? It is true. So, so true…. My Ma actually had one of my cousins working a drive-through notice the car pulling up, and had the usual order ready when she got to the speaker. The sadder thing is when you pull up they say ‘Oh, hey, pull up to the next window, we’ve got it already’ because they recognized the sound from a block away.